These are the messages sent by ordinary Chinese tourist about their trips to Tibet, collected by the International Campaign for Tibet, and published on their website. While Tibetans themselves face fierce internet restrictions and harsh penalties if they try to spread information about the military occupation, Chinese tourists appear to be inadvertently breaching “the great Firewall of China” by sharing holiday snaps with friends back home. The messages and photos, which have been leaking out fairly infrequently since 2009, represent a rare source of information for those interested in repression in Tibet. The tourists post photos of the considerable military presence — despite occasional warnings. Most comment on the large numbers of troops deployed. One photo shows a column of a hundred or so Chinese soldiers marching down a street. Another shows armoured cars on the move, and another a cohort of tanks. A picture sneakily snapped behind some marching soldiers shows fire extinguishers strapped to their backpacks. Also striking amongst the comments are what appear to be genuinely held fears by Han Chinese tourists about the Tibetan residents. “Tibetans have a very strange look in their eyes, especially at night. It’s best not to do anything on the street by yourself,” said one, who admitted to carrying a Swiss Army knife during his trip, for protection. These images are precious. Research in 2012 showed that half of all Weibo posts originating from Tibet were being deleted, compared to just 12% in Beijing. Last year, authorities installed a new system for monitoring both internet and phone traffic — while Tibetans living in nearby Sichuan province have seen their internet connections shut down en masse. Translations of the messages were posted on China Digital Times, an independent news website with a focus on freedom of expression in China’s complex and highly restricted online space. Dechen Pemba, UK resident but editor of the Tibetan website High Peaks Pure Earth, put the leaked images in perspective: “Tibetans are not free to comment, document or report on their own situations. You only have to look at what happened to Dhondup Wangchen in 2008,” she told Index. Wangchen was sentenced on 28 December 2009 following a secret trial in Xining city, western China, receiving six years in prison for producing a documentary film interviewing 100 Tibetans. He is one of many Tibetan political prisoners in China. 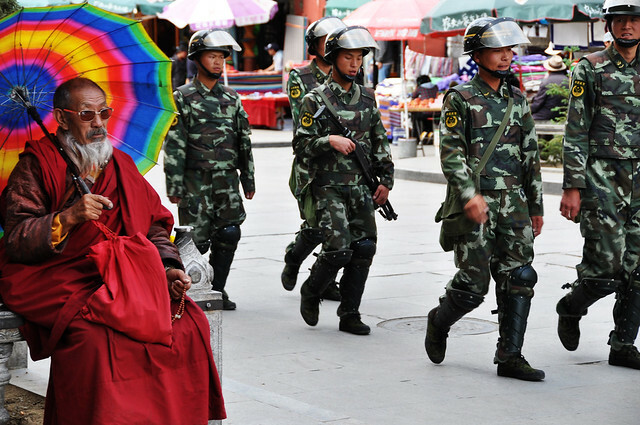 “Tibetans are well aware of the risk of using Weibo and public platforms online,” says Pemba. “Despite controls, Tibetans are also finding other ways to speak out and express themselves such as through poetry and song.” Pemba’s blog has been key in highlighting this trend — offering translations of works by Tibetans. During high-tension periods, Chinese forces are not afraid to take special measures. In 2011, Pemba points out, searching Chinese social media site Weibo for mentions of “self immolations” yielded zero results. This was strange, given seven self-immolations had occurred in the past three weeks. The Save Tibet campaign continues to document all of these images, under the title “Has life here always been like this?”. It has been extremely difficult to find information about Tibet without either going there, or relying on opportunistic citizen journalism. Chinese tourists, snapping away and posting to Weibo, provide a surprising back-channel into the Tibetan struggle. Alastair Sloan is a London-based journalist writing about injustice, politics and international affairs. His work appears regularly in The Guardian, The Independent, The Huffington Post, Policy Mic (columnist) and Index on Censorship. What can we do for Tibet?!! Politicians are cowardly and only think of national interest.. I wish i would know how to help Tibet get its freedom and save the Tibetan culture…. SHAME ON YOU ALL AND MICHELLE OBAMA WHO HAVE BEEN IN CHINA. Money talks. You have no values, no principles and no Honnar. Shame on all presidents who still stand silent. One day i will set oneself on fire in front of a chinese embassy with the Tibet flag, picture of HH Dalai Lama to stand by the voiceless Tibetans in Tibet. It will be an Honnar to die that way, you small litle people, small chinese. We have always been able to document the heavy-handedness of the Chinese in Tibet. Crackdowns from 1988 onward have been photographed and thoroughly analyzed–none of this is new. What is unfortunate is that we have deluded ourselves into believing that a simple reporting of events passes as activism–it does not. Or, that we can effect real, positive change for Tibetans by commiserating together on social media–we can not. China is moving to assimilate Tibetan culture into its vision of a “Greater China” at an unprecedented rate. If we continue our failure to directly address the mechanisms of this, as well as the core Tibetan concerns of self determination, Statehood, and the return of the Dalai Lama to Tibet; in a few years, there will be nothing to report and no photos to glean from Chinese tourists. There will also be no Tibet as we know it.